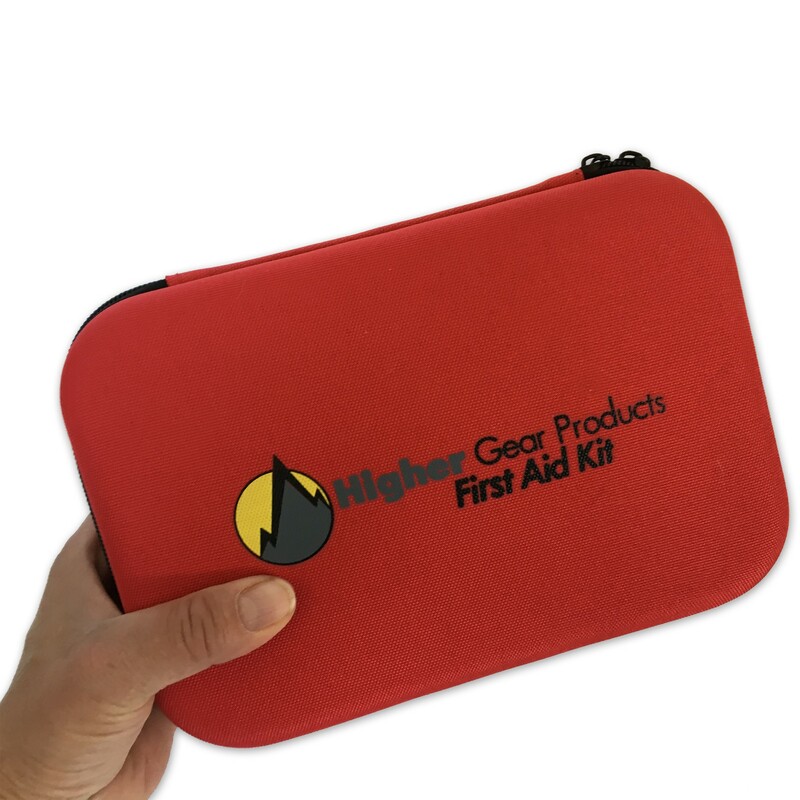 The Higher Gear Products First Aid Kit -- just launched on the major online shopping platforms today -- is an essential accessory for home, office, outdoor adventures and travel. 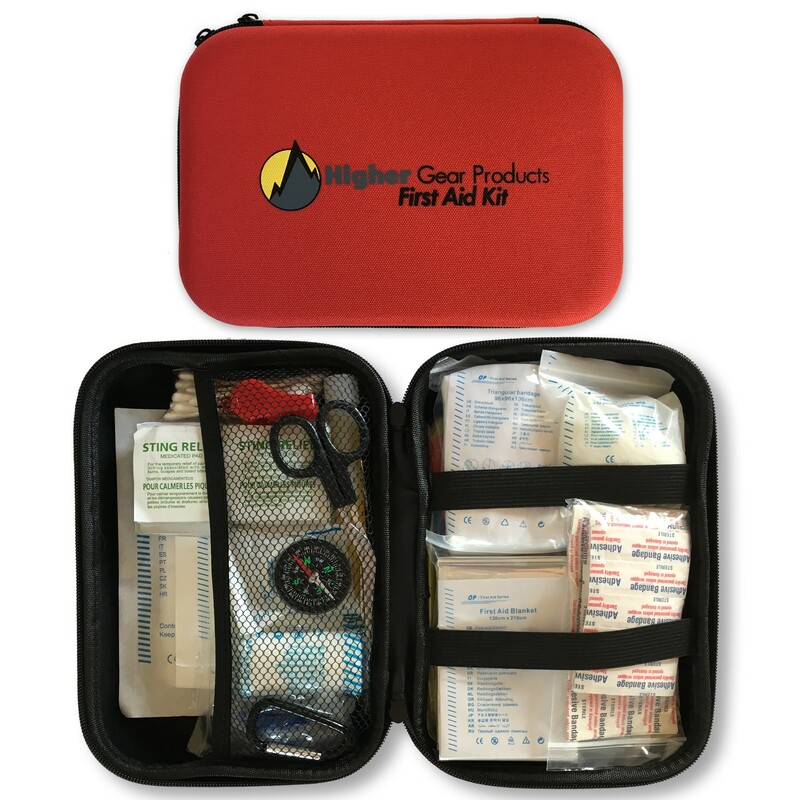 Higher Gear Products® LLC has announced the market introduction of its newest product, the Higher Gear Products First Aid Kit which is now available for sale on the Amazon Marketplace. 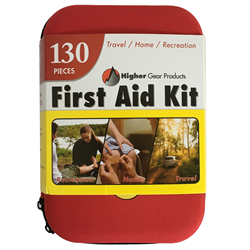 The Higher Gear Products® First Aid Kit is an essential accessory for the home, vehicle, workplace, classroom, outdoor adventures, and vacation travel. This compact-sized (9" X 6" X 2.25”) 130 piece first aid kit includes everything you need for medical emergencies, injuries, scrapes and bumps -- scissors, tweezers, 6" glow stick, rescue whistle, compass, bandages (multiple sizes), gauze swabs, first aid tape, antiseptic wipes, bee sting relief, blister relief, disposable gloves, emergency blanket, disposable raincoat, CPR face mask, and much more. 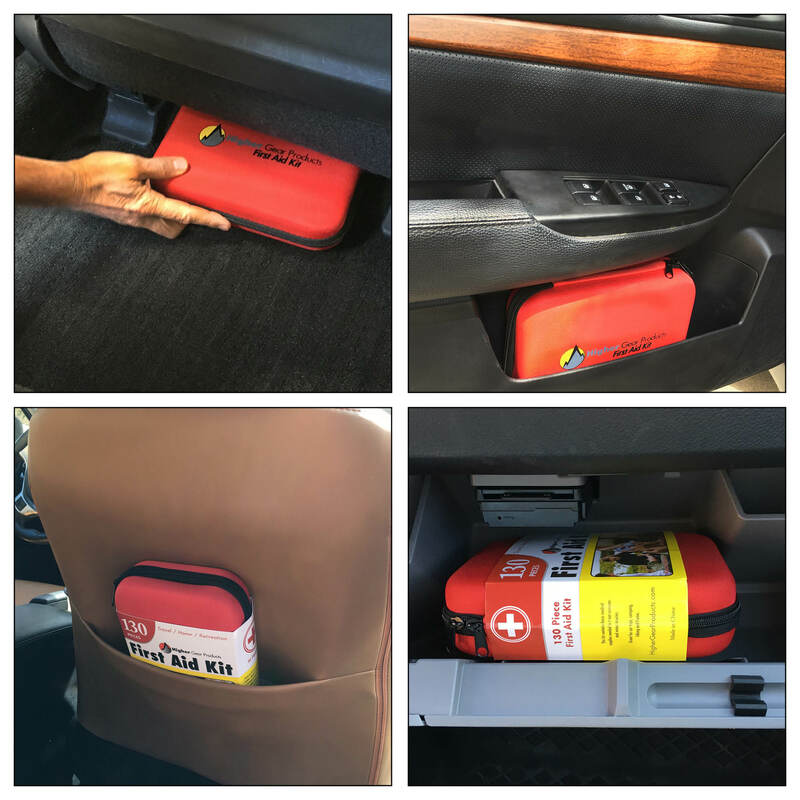 In addition, unlike most offerings in this product category, the Higher Gear First Aid Kit fits in tight and small spaces for easy storage while keeping items organized -- In your car's glove box, truck, SUV, boat, child's stroller & bike saddlebag. Pack in your backpack for hiking, backpacking, running, day trips and the kids' sporting events. Include in your luggage for emergencies while on vacation. 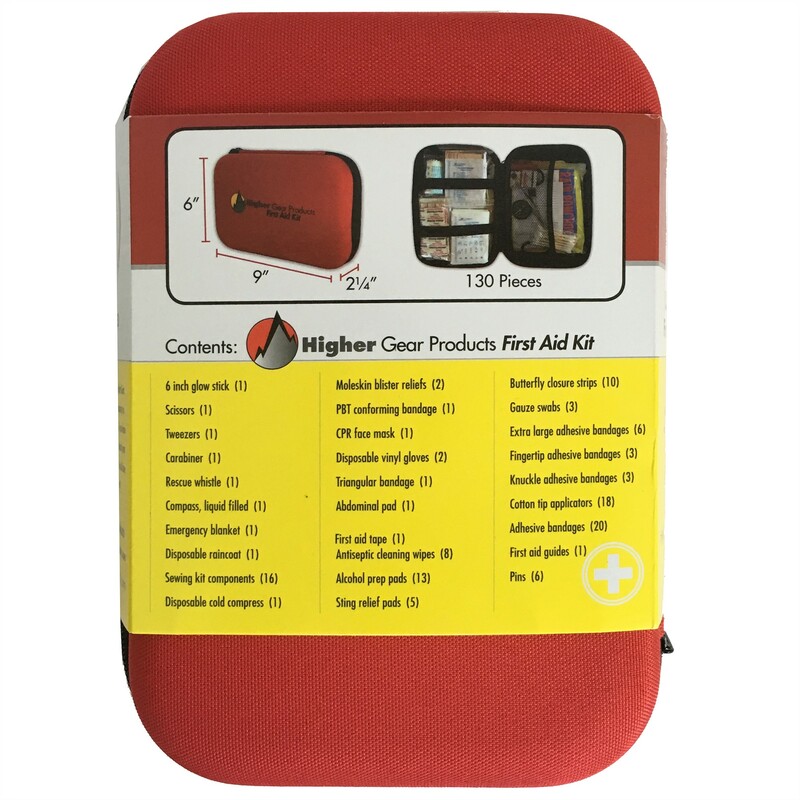 And when it counts most, the Higher Gear Products First Aid Kit offers a water resistant hard shell case that protects and preserves contents for when you need them the most -- During an emergency. 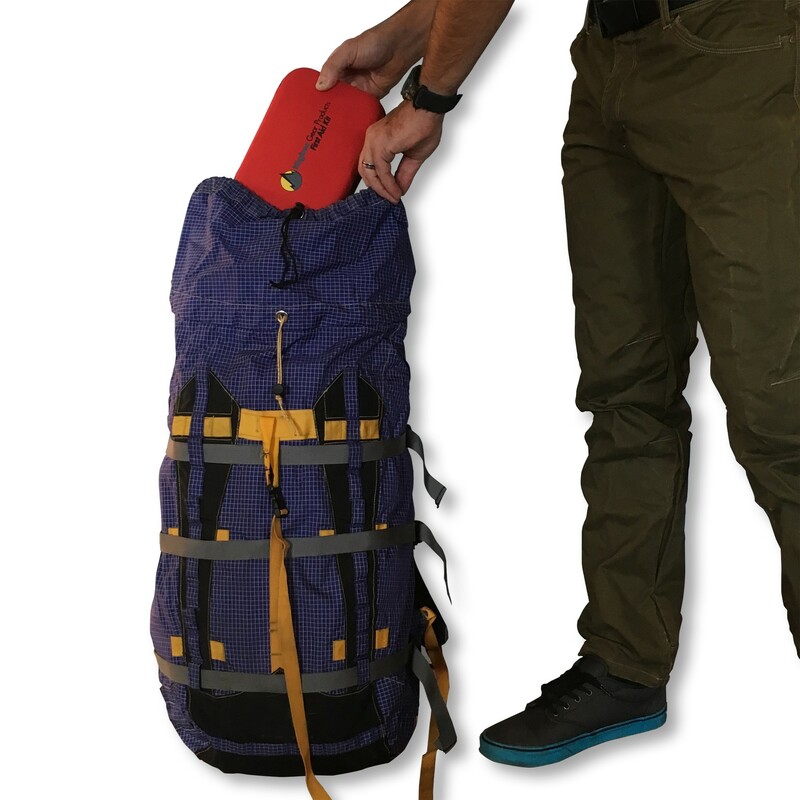 The inside compartment is designed for ease of access and features a see-through mesh pocket on one side and elastic straps on the other for ease of locating items at a glance and easy access in an emergency situation. A high quality, no-jam zipper around the case ensures quick access when needed and effortless closing when not in use. Founder & CEO, Tim DePuy, stated “The Higher Gear Products® First Aid Kit is the result of hundreds of hours of research into this deceptively simple medical accessory. As outdoor enthusiasts, we wanted to improve upon the typical first aid kit by only including the items and tools needed in an emergency. Other first aid kits are bloated with too many things, unnecessary things that make the kit heavy and bulky, while making it difficult to locate the materials you need when you need them." The Higher Gear Products® First Aid Kit is now available for purchase on Amazon.com and for a limited time is being offered at an introductory price. Included with the purchase is the First Aid Kit and bonus eBook “How To Build The Ultimate Disaster Survival Kit". Based in Steamboat Springs, CO, Higher Gear Products® is a subsidiary of SmarterLife Products and sources or creates the very best lifestyle products for people who want to live smarter. The company was started when founder Tim DePuy realized that it was hard to find purposefully made lifestyle products that were of the highest quality and designed with smart functionality in mind. While available in the marketplace, no one had brought them together into one place, which was the impetus for the creation of the company.